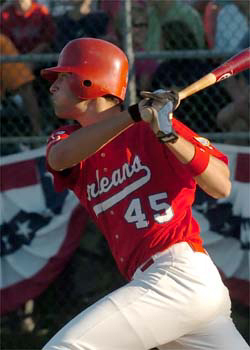 Orleans Cardinals first baseman Nate Freiman is the recipient of the Manny Robello 10th Player Award, given annually to the Cape Cod Baseball League player who shows continuous effort and leadership throughout the season, but often goes unnoticed as his effort is not necessarily reflected in his statistics. The 6-foot-7 Freiman was a cornerstone of the Orleans lineup and became a fan favorite for his competitiveness and demeanor. Freiman performed admirably for the Cardinals, both defensively and offensively. The Duke University junior committed only two errors and was an essential part of the Cardinals infield. Freiman compiled a .289 batting average, the second highest on the team, and was fifth over-all in the Cape League with 28 runs batted in, helping lead the Cardinals to a 23-20-1 record. Freiman also was a great role model for children who attended the clinics the Cardinals hosted each weekday morning. He formed a special bond with his host family’s son, Nate Garran, also the Cardinals’ bat boy. Frieman was named the Coca-Cola Player of the Week for the final week of the Cape League’s regular season. Over his last three games, he went 5-for-11 with four RBI and three runs scored. In his final Cape League game, he led the Cardinals to a 9-5 victory with a two-run, opposite-field homer and three RBI. Freiman will return to Duke’s baseball team after leading the Blue Devils with a .369 batting average as a sophomore. He started all 54 games for Duke in 2007 and tied for the team lead with 48 RBI and seven home runs. His efforts both on the field and in the classroom earned him his second All-ACC Academic recognition as well as Academic All-District III Second Team honors from ESPN The Magazine. The award is presented in memory of longtime Cotuit volunteer Manny Robello, who contributed more than 40 years of service to the Kettleers and the Cape Cod League. Robello was a member of the original Cotuit team in 1947. An infielder, he was one of three brothers to play for the team at various times. The Cotuit native later served as a director for both the Cotuit Athletic Association and the Cape League for many years and was a former Cotuit A.A. president and Cape League treasurer. He died in 1986.